IP Enclosures is a leading, high-quality Australian brand of electrical enclosures. We provide wall-mounted electrical enclosures and floor-standing electrical cabinets up to IP66 for low-voltage switchgear and controlgear assemblies. The full range can be provided in powder-coated galvanised steel, aluminium or grade 316 stainless steel. Our enclosures conform to IEC62208 and IEC/EN/AS60529 with protection up to IP66. Electrical enclosure accessories including rain hoods, inner doors, sun shields, locking, mounting brackets and inspection viewing window kits are available to suit all sizes. Thermal management products including ventilation fans and filters, heaters and controllers can be provided separately or as an assembly. A range of IP66 19” data racks and fan trays are available to house sensitive data network equipment in harsh environments. Fire pump controller enclosures are available and we also provide custom electrical enclosures to suit specific project requirements. Our electrical enclosures have been designed in Australia and precision manufactured to the highest standards using world-class international manufacturing facilities in Europe. Our range of enclosures comply to IEC62208 and IEC/EN/AS60529 up to IP66 IK10, NEMA 4 and NEMA 4x certified by an independent accredited test laboratory. UL508A certification is also available. They are suitable for up to 1000 V AC at frequencies not exceeding 1000 Hz or 1500 V DC. Incorporating many advanced design features as standard inclusions, IP Enclosures has been chosen by many organisations as their standard enclosure system. 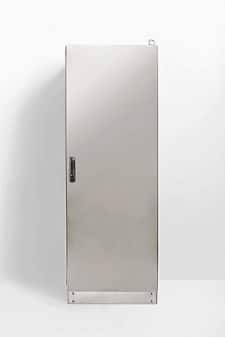 IP Enclosures IP-SSPB Range of grade 316/316L stainless steel pushbutton enclosures are suitable for extreme duty heavy industrial applications. They are available in 1 hole, 2 hole, 3 hole and 4 hole configurations. IP Enclosures provide a wide range of ventilation products for electrical enclosures. The new range consists of a modern Italian grill design with minimal external projection and allows for easy filter maintenance due to a front-opening grill. Electrical Enclosure Assemblies – Custom is now Standard ! IP Enclosures have standardised ventilated electrical enclosures. Our full range of high quality electrical enclosures can be supplied fitted with various combinations of ventilation products including louvre vents, filter vents, fan-filters and vent hoods. Enclosures are available in a range of standard colours to suit a variety of industries and applications including mining, industrial, fire, security, data and communications.